Dominating the corner of North Street and Waring Street, the Grade B1 listed Assembly Rooms, formerly The Exchange, was built in 1769 as a single-storey, arcaded Market House on a donation of £4000 from the Earl of Donegall as a celebration of the birth of his son, George Augustus. In 1776, again at the request of the Earl, and this time at a cost of £7000, Sir Robert Taylor, a prominent London architect added an upper storey which became known as the Assembly Rooms. 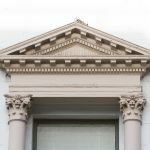 Further radical changes were made by Charles Lanyon in 1845, when it was refaced in stucco and converted to use as a bank. Alterations by W. H. Lynn in 1895 removed its ‘splendid classical interior’, something which Lanyon had respected some 50 years previously. Further extensions were added in 1875 by W. H. Lynn, in 1919 by Tulloch & Fitzsimons and finally in 1956-59 by G. P. & R. H. Bell. The building was listed in 1975, shortly after winning an award for ‘Best-Kept Large Building in the city of Belfast’ in 1969. Said by some to be the oldest public building in Belfast, this suggestion was refuted by Larmour, who considered that “…the Old Exchange and Assembly Rooms as they were in 1776 have in fact now disappeared from view” (1987, 14), due in no small measure to the series of changes that they went through over their lifetime. 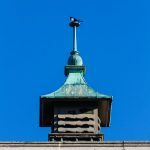 Regardless of its age, it is one of the finest public buildings in Belfast, in a very prominent location at the ‘four corners’, from where all of the milestones out of the city were once measured. 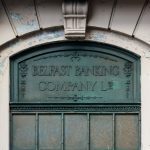 The financial use continued until the Northern Bank (formerly The Belfast Banking Company) moved from the premises leaving the building vacant from c. 2000 with subsequent deterioration necessitating its addition to the Heritage at Risk Register in 2003. At present the building remains empty, but being located within the periphery of the re-branded ‘Cathedral Quarter’ the building has served occasional temporary meanwhile uses such as music gigs and art exhibitions in its somewhat faded grandeur. 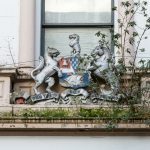 Unfortunately, as the building stands today it would not be awarded the accolade of ‘Best-Kept Large Building’ building in Belfast, as in cases such as this the general maintenance of the building has fallen by the wayside and it has suffered from vandalism. An unfortunate outcome for one of Belfast’s most prominent buildings that was once a thriving area. The effects of development limbo and changing patterns in the commercial sector have had a very damaging effect on the Waring Street, North Street and Garfield Street vicinities; where many of Belfast’s remaining historic buildings including the imposing Bank of Ireland, a unique and rare 1930s Art-Deco building, the former flourishing North Street Arcade, and the curved Garfield Buildings are at risk. Proposals are in place for the Assembly Rooms to be turned into a boutique hotel, as part of the wider former Royal Exchange Scheme. The planning application would see the demolition of the 1875 North Street extension by W. H. Lynn, despite its inclusion in the Assembly Buildings listing. 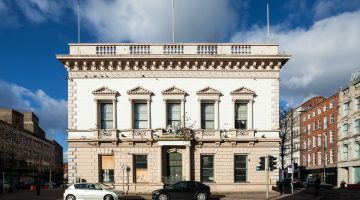 Ulster Architectural Heritage have advocated that the demolition of the North Street Extension would see the removal of a piece of architecture contemporary to the Assembly Rooms and does not meet policy requirements. Meanwhile, the Assembly Rooms will remain at risk. Buildings on neighbouring Donegall Street have already experienced arson attacks, heightening the extent of risk to the Assembly Rooms. Vandalism issues raise questions around the security monitoring of these vulnerable buildings when not in regular use. 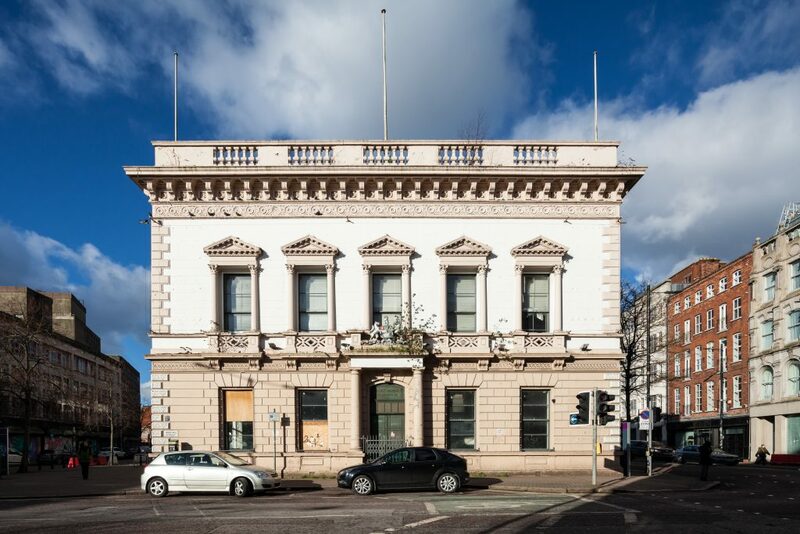 It is shocking that such an architecturally important and historically significant building as the Assembly Rooms, latterly the ‘Best Kept Large Building’ in Belfast can come to be treated as a mere derelict eyesore. The situation may be seen to indicate a lack of awareness of the value of Belfast’s historic assets, on the part of the governance of the City and the failure of successive planning regimes to consistently apply historic building planning policy. The restoration of the Assembly Rooms would be an exemplar of heritage regeneration for Belfast and an indication that the City is revaluing its pride of place and character. 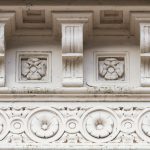 However in the short-term, remedial works to the façade, removal of vegetation and safeguarding of the building is urgently required. Action that may be encouraged by way of enforcement. If not, the loss of more of the remaining historic fabric of this important heritage asset will be assured.